William Donald Albright was born in South Cayuga, Haldimand County, Ontario on August 15, 1881, to Josiah D. and Sarah Elizabeth (Moyer) Albright, and was of Pennsylvania Dutch heritage. The Albright family moved to a Beamsville fruit farm when William was 13. He attended two years of high school, one year junior Matriculation, and took a two-year associate course at Ontario Agricultural College (OAC), Guelph from 1901 to 1903 for which he won the Governor-General's prize for general proficiency. Following graduation in 1903, he became Editor-in-chief of the Maritime Farmer in Sussex, New Brunswick. A year and a half later, he returned to Ontario, becoming associate editor of the London, Ontario Farmer's Advocate in 1905. Three years later he was promoted to managing editor. In 1911, Albright convinced the Advocate's publishers to purchase and run Wildwood Farm near London with him in charge. On May 22, 1908, Albright married Eva Belle Lossing, only daughter of Richard Cromwell and Mary Ann Avey Lossing, from Otterville, Ontario. The Albrights later had three children: Florence Eileen, born in London, Ontario, and Frederick Bruce and Robert Gordon, born in Beaver Lodge, Alberta. Eileen later married William Ross and Gordon married Ruth Lowe. Bruce joined the RCAF during World War II and died in the Essen raid June 2, 1942. In 1913, the Albrights left Ontario to join Mrs. Albright's parents, Mr. and Mrs. R. C. Lossing, who were part of the Bull Outfit and had settled in Beaver Lodge, Alberta in 1909. The Albrights arrived in Beaver Lodge on October 26, 1913 having journeyed by steamboat up the Athabasca, by freight-cache steamboat down the Athabasca river and across Lesser Slave Lake to Grouard, and finally overland by wagon the remainder of the way. They filed on a homestead and purchased a South African scrip from Mr. Lossing. Albright eventually owned three-quarter sections of land, SE 6-72-9-W6 (the homestead), SE 1-72-10-W6, and SW 1-72-10-W6. Albright wrote to the Director of Dominion Experimental Farms, Dr. J. H. Grisdale in early 1914 offering to do a few tests to increase the amount of knowledge available on crops suitable for the area, if seed was provided. He was given grants in 1915 and 1916 to carry out more work and in 1917 the government offered to lease 20 acres of his land and pay him a part-time salary to conduct experimental work, thus establishing the Beaverlodge Dominion Experimental Sub-station. Albright assumed the position of Superintendent on April 1, 1919. The sub-station continued to increase in size and staff in the succeeding years and buildings, including an experimental threshing barn with a bunkroom and office, a silo, log boarding house, garage, greenhouse, portable hog cabins, gothic-roofed barn, bunkhouse, and small staff houses, were gradually added. The Government finally bought the farm (about 318 acres) in 1940 and in 1941 the sub-station achieved full station status. Various experiments were undertaken at the research station with different types of crops, livestock, and methods, allowing the station to provide suggestions to farmers in the area. Connected with the Beaverlodge sub-station were five illustration stations: two in British Columbia at Baldonnel and Pouce Coupe and three in Alberta at Fairview, Dreau, and High Prairie. Albright spent his summers visiting most communities in both the Alberta and British Columbia sections of the Peace River country "attending field days, visiting the five illustration stations to collaborate with their owners and operators" and lecturing, frequently against the backdrop of his lantern slides. Many of the slides were produced from his own photographs. Albright was willing to go to "any accessible point in northern Alberta or northern British Columbia" as long as there was a hall available at no charge to the Station which would be heated, lighted, and opened to allow them to start exactly when scheduled. Albright was also a writer and poet. From 1928 onward, approximately 20 western Canadian newspapers carried his weekly column, "Timely Hints" which addressed agri-business concerns. Albright was also very involved in the local community. In 1918 he helped organize a 1200 name petition to extend the Edmonton, Dunvegan and B.C. Railway. He was president of the Beaver Lodge Board of Trade for several terms beginning in 1931. Due in part to his efforts, the Associated Boards of Trades of the Peace River was organized in 1931 and Albright served as president for the organization's first two years. He also served as chairman of a local advisory committee for the Saskatoon Island and Saskatoon Mountain Parks, a member of the committee for Canada of the International Geographical Union, Chairman of the local War Finance Committee, President of the local Red Cross, President of the West District Hospital Association, a Director of the Monkman Pass Highway Association, and Chairman of the School Board. Albright also had a few noteworthy travels during his time as Beaverlodge Substation's Superintendent. In 1930, he took a three week trip to southern British Columbia in connection with the On-To-the-Peace association. After this trip, he flew down the Mackenzie River, exploring and gathering information on the area's agricultural potential. The lantern-slide show he produced from his photographs was the most popular one in his repertoire. In 1937, Albright went to Ottawa to be editor of the publication "Fifty Years of Progress on Dominion Experimental Farms 1886-1936. ";Albright became ill with Parkinson's Disease around the beginning of World War II, but continued his work until he was forced to retire in March 1945. The Albrights moved to the more beneficial climate of Haney, B.C. in October of the same year. He died at Haney less than a year later on May 1, 1946 and was buried in the Beaverlodge Cemetery. Eva Belle Albright later moved to Edmonton and died in 1978. Albright summed up his long career and many accomplishments in his "Timely Hints" column of March 28, 1946, stating that "Four or five thousand photographs have been taken and 1,000 lantern slides made. Scores of mimeographs have been prepared and thousands of articles penned. Each annual report, whether printed or not, has amounted to a volume. Between 50,000 and 100,000 letters have been written by the staff. Twelve years' records have been kept of 409 lectures delivered in 100 halls and schoolhouses all over the Peace and Athabasca watersheds and beyond... Visitors have been entertained by scores of thousands. The register is adorned with the names of four Governor-Generals, three or four Lieutenant Governors, two or three premiers, two railroad presidents, many statesmen and cabinet ministers, scientists, tourists, land seekers and travellers with addresses spread from Sweden to Hong Kong, not forgetting a Vice-president of the United States. ";In January 1946, Albright was granted an honourary Doctorate of Laws by the University of Alberta "in recognition of his service to agriculture and his part in the development of the Peace River region." Following his death, the "W. D. Albright Scholarship Fund" was set up with subscriptions by the settlers of the Peace to assist 24 Peace River region students pursue further education. He was honoured further with a memorial cairn erected by the Historic Sites and Monuments Board of Canada at the Beaverlodge station. After the death of W. D. Albright, the textual records passed to the custody of his wife, Eva Belle Albright. She and Francis Flint tried to organize the records and asked for help from Francis’ daughter, Beth Sheehan. Beth eventually inherited the records and later donated them to the Grande Prairie Public Library. The Library added them to the Charles Spencer reference collection. In 2008, GPPL passed them on to South Peace Regional Archives. The glass lantern slides and index cards originally belonged to the Beaverlodge Research Station which discarded them. The slides were rescued by Bill Sterr and preserved by South Peace Centennial Museum. In 2009, with the agreement of Mr. Sterr’s partner, Margaret Pfau, they were donated to South Peace Regional Archives. Copies of some lecture notes were also donated with the slides. The fonds consists of lecture notes, addresses, radio addresses, articles, research materials, and slides and index cards created or gathered by W. D. Albright. The material dates from 1890 to 1945 and relates to Albright’s work as a speaker and author, connected with his role as Beaverlodge Experimental Substation Superintendent. 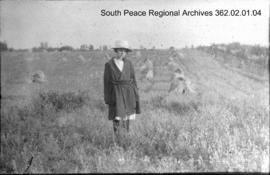 In 2008, the Grande Prairie Public Library passed the textual records on to South Peace Regional Archives. 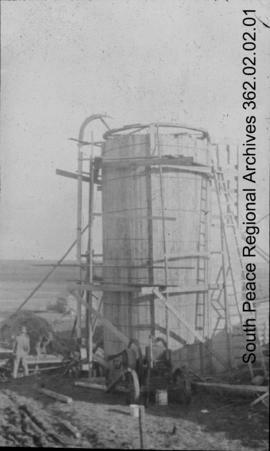 In 2009 the slides were donated to South Peace Regional Archives. Copies of some lecture notes were also donated with the slides.